Bay windows and dormers give this country cottage floor plan a romantic air, while a greenhouse adds an element of surprise. 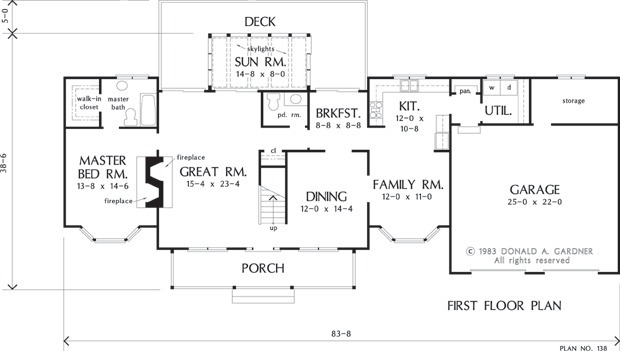 The bayed family room is open to a well-planned kitchen, which services both the breakfast area and dining room. The great room and breakfast area access the large deck, which flanks the greenhouse on three sides. A fireplace in the master bedroom of this house plan adds to the romantic appeal, while upstairs, two dormered bedrooms share a bath. 1st Floor: 1454 Sq. 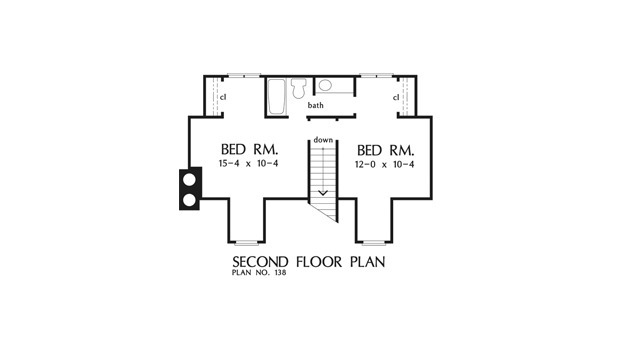 Ft.
2nd Floor: 544 Sq. Ft.
House Dimensions: 83' 8" x 38' 6"
Great Room: 12' 0" x 11' 0"
Master Bedroom: 13' 8" x 14' 6"
Master Bedroom : 13' 8" x 14' 6" x 9' 0"
Bedroom #2 : 15' 4" x 10' 4" x 8' 0"
Bedroom #3 : 12' 0" x 10' 4" x 8' 0"
Porch - Front : 28' 0" x 6' 0" x 0' 0"
Deck / Patio : 31' 8" x 5' 0" x 0' 0"
Living Room : 15' 4" x 23' 4" x 9' 0"
Other (Vaulted): 15' 0" x 8' 0" x 9' 1"
Great Room : 12' 0" x 11' 0" x 9' 0"
Kitchen : 12' 0" x 10' 8" x 9' 0"
Breakfast Room : 8' 8" x 9' 0" x 9' 0"
Utility Room : 7' 0" x 6' 8" x 9' 0"
Garage : 22' 0" x 20' 6" x 0' 0"
Garage Storage : 13' 0" x 6' 8" x 0' 0"